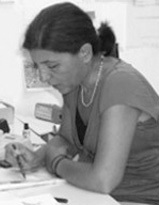 Eleni Hadjinicolaou is an architect, with undergraduate studies, MA degree in Architecture from the National Technical University of Athens (N.T.U.A.) (1974-1979), and postgraduate studies, MSc in Advanced Architectural Studies at the Bartlett School of Architecture and Planning, University College London (1980-1981). During her studies, she was a member of the Editorial Board of the Architectural Magazine 9Η (vol. 3 1982, vol 4 1982, vol 5 1983). Since 2014-2015, has been a Special Teaching Staff at the Department of Architecture, School of Architecture, Engineering, Land and Environmental Sciences at Neapolis University Pafos. She was a member of the Candidacy Dossier ‘Athens 96’ Bid Committee, headed by the internationally known architect George Candilis (1987-1990). She was one of the members of the representative team responsible for the submission of the Candidacy Dossier ‘Athens 96’ to the Olympic International Committee, in Lausanne. Also she participated in the team for the support of the Candidacy Dossier ‘Athens 96’ in Tokyo where the decision and announcement of the winning city took place. She was also a member of the Candidacy Dossier ‘Athens 2004’ where she was responsible for the projects Olympic village, Main Press Centre and International Broadcasting Centre. Her design focus, shifts from small scale to the larger urban context projects and articulates the importance and complexities of issues faced at all scales (1983 until now). Her projects were selected and published in architectural magazines and books. They have been also presented in architectural exhibitions with more recent the presentation of two of her projects at the Cypriot pavilion in the Biennale 2018 in Venice (Biennale Architectura 2018). She is also a recipient of awards from the Architects’ Council of Greece (SADAS).